It is replaced by the Fargo DTC300. These robust, affordable printers give you great-looking, high-resolution cards for an entire spectrum of personalized applications. The Persona C25 features built-in RAM, so your system can process information while still printing cards. An easy-to-use software driver makes printing a snap, and the LCD display provides instant notification of status and diagnostics. 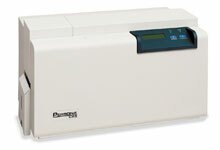 Plus, an input capacity of up to 100 cards means you'll have longer, uninterrupted batch printing. Thermal transfer, 300 dpi, full color printing, up to 600 cards per hour, parallel interface, 4MB RAM. Includes e-card docking station, dual hi/lo coercivity magnetic stripe encoder & power cord. Order cables separately. See accessories. Thermal transfer, 300 dpi, full color printing, up to 600 cards per hour, parallel interface, 4MB RAM. Includes smart card contact station & power cord. Order cables separately. See accessories. Thermal transfer, 300 dpi, full color printing, up to 600 cards per hour, parallel interface, 4MB RAM. Includes dual hi/lo coercivity magnetic stripe encoder & power cord. Order cables separately. See accessories. Thermal transfer, 300 dpi, full color printing, up to 600 cards per hour, parallel interface, 4MB RAM. Includes power cord. Order cables separately. See accessories. YMCKO Cartridge with Cleaning Roller, Full-Color Ribbon With Resin Black And Clear Overlay Panel for C30E Printers, 250 Images Per Ribbon, Single Ribbon. Polyguard 1.0 mil Overlam, Globe, 250 prints. Overlam has thin "border" around the edges. HDP8500 Cleaning Kit-includes 4 printhead cleaning swabs, 10 cleaning cards, 10 cleaning pads and 3 alcohol cleaning cards.